The ATM2 is a very helpful piece of equipment for rehab. ATM or Active Therapeutic Movements (ATM®s) provide immediate and long-lasting benefits to many back, neck, shoulder, pelvis, hip, and knee sufferers. This approach aims to normalize movement impairments that are related to the patients’ complaints. Body areas are mobilized until the pain is eliminated. 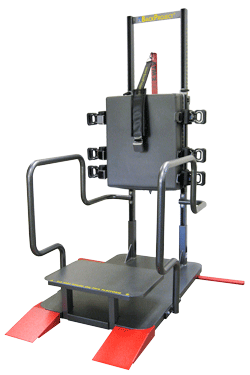 The ATM®s consist of active neuromuscular movements superimposed upon a specific passive holding. Which means that the person is strapped to the pad to create support for the affected joint, and certain active movements are done to correct and realign that joint as well as re-teach the joint to move correctly. This is all pain-free and symptoms should be immediately improved. ATM®s aim to immediately alter symptoms, by affecting the Central Nervous System control.